Tonight in New York's American Museum of Natural History, Juan Carlos from Mano a Mano and Courtenay Greenleaf of the Richard Sandoval Resturants will be joining forces in the Linder Theatre to bring you a taste of Mexico. 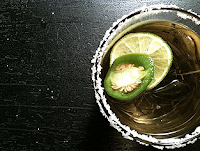 In preparation for your Cinco de Mayo celebrations, treat yourself to this lesson in the cultural history of tequila and chilies (and it may inspire the cocktail menu you've been planning). Besides the wicked knowledge you'll gain, the $30 ticket includes tequila flights and little tastes of chili-based dishes. Purchase your ticket here! May 3 Voted Best Cocktail Blog!